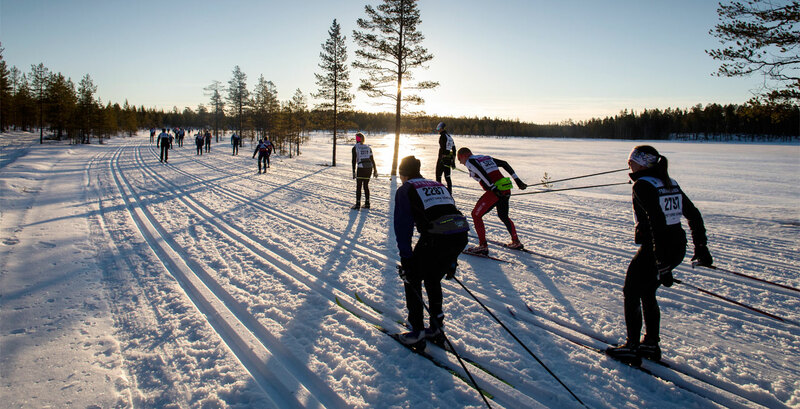 Vasaloppet’s Winter Week takes place every year with several cross-country ski races over the course of ten days, finishing with the classic Vasaloppet on the first Sunday in March. All races run in the Vasaloppet track, in the Vasaloppet Arena; a ninety kilometre scenic nature reserve between Sälen and the famous finish line portal in Mora. The first race, running on the first Friday, is Kortvasan from Oxberg to Mora. On Saturday, Tjejvasan runs along the same stretch. Sunday follows with Ungdomsvasan for youths up to the age of 16, starting in Eldris and Hökberg. Öppet Spår, starting in Sälen, runs on both Sunday and Monday. On Tuesday it’s time for Halvvasan, which starts in Oxberg and runs along the Oxberg lake before joining up with the Vasaloppet track. Friday means Stafettvasan, a relay race that splits the course from Sälen to Mora into five sections. The night to Saturday is when Nattvasan 90 and Nattvasan 45 take place, the only two races during the Winter Week where skate style is permitted. The week warps up with the world’s biggest cross-country ski race, the massive Vasaloppet where 15,800 registered participants ski along what’s been called the “main artery of Swedish skiing”! But Vasaloppet’s Winter Week is so much more than just skiing. For example, don’t miss out on the Vasaloppet Trade Fair in Mora which has about 200,000 visitors every year. Or the Vasaloppet festivities in Mora Church, held according to tradition since 1922, with a celebrity holding the ceremonial speech, and the crowning of the year’s Kranskulla. Vasaloppstrippeln, the Vasaloppet trifecta, is a challenge where participants complete three 90-kilometre or 45-kilometre Vasaloppet races during one calendar year.